The DC Rollergirls are a women’s non-profit roller derby league that brings its hard-hitting, rough and tumble skate action to Washington, D.C. from September to May each year. A volunteer-run organization founded in 2006, the DC Rollergirls are the premier women's flat track roller derby league in the national capital region. The league consists of four home teams (Cherry Blossom Bombshells, DC DemonCats, Majority Whips, Scare Force One), and two travel teams (The DC All-Stars and our B-Team, The Capitol Offenders). 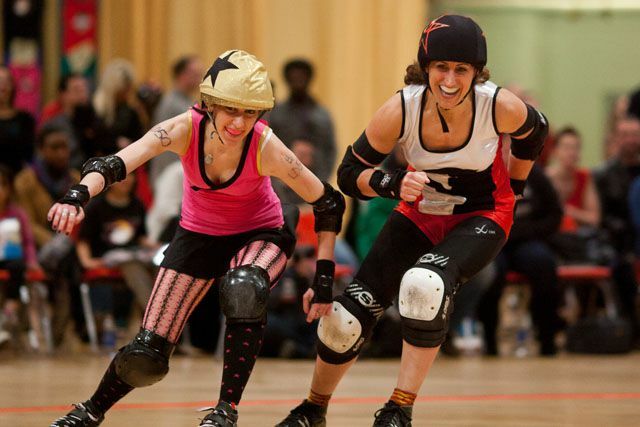 The home teams compete against each other at the DC Armory and the Dulles Sportsplex, while the All-Stars battle for WFTDA international rankings across the country. What is Flat Track Roller Derby? Flat track roller derby is a fast-paced contact team sport that requires speed, strategy, and athleticism. Each team fields up to five skaters per two-minute playing segment, called a “jam.” Blockers play both offensive and defensive roles in a defined “pack” on the oval track. Jammers score points for their team by lapping opposing players. Skaters may be penalized for committing foul. Teams skate short while they have one or more players serving a penalty. The flat track roller derby has grown rapidly since 2000 as the ability to mark track boundaries on a skating rink floor or other venues, rather than building and storing a large banked track, made it possible to play the game just about anywhere. Doors open at 3 p.m. and the action begins at 4 p.m.
DC Armory - 2001 East Capitol Street, SE Washington, DC. The DC Armory is easily accessible by Metrorail on the Blue and Orange lines (Stadium-Armory station) and numerous bus lines. On-site parking is available. Tickets are $12 for ages 12 and up, $6 for children 6 to 11, and free for kids 5 and under. Tickets are available in advance at Ticketmaster.com or at the door. Individuals with a valid military ID can purchase tickets for $10 at the door. Founded in 2004, the Women’s Flat Track Derby Association (WFTDA) is the international governing body for the sport of women’s flat track roller derby, and a membership organization for leagues to collaborate and network. The WFTDA sets standards for rules, seasons, and safety, and determines guidelines for the national and international athletic competitions of member leagues. There are currently 160 WFTDA member leagues and 87 leagues in the WFTDA Apprentice Program. Take a Guided Tour of NPR World Headquarters in Washington, D.C.
See Maps of the Capital One Arena in Washington, D.C. The Best Art Museums to Visit in Washington, D.C.
Visit the World War I Memorial in Washington, D.C. Kick Off Your Holiday with Black Friday Shopping in Washington, D.C.